This program combines experiential learning, theory and practice in the person-centered philosophy of Carl Rogers and the expressive arts: movement, sound, visual arts, creative writing and drama. It is transformative work—awakening creativity, encouraging authenticity and fostering self-empowerment. Upon completion of this program, students will receive a certificate from the Person-Centered Expressive Arts Institute. 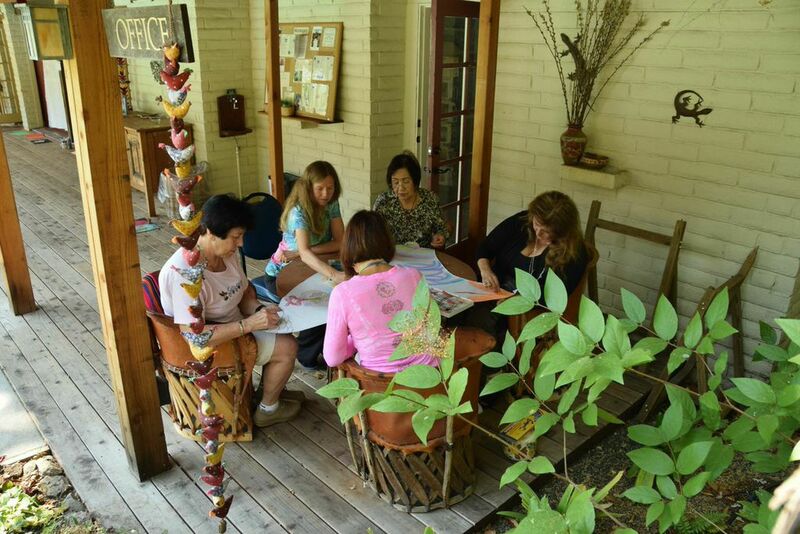 Participants come from around the globe to learn how to use the expressive arts in counseling, teaching, mediation, social action and group facilitation, or to awaken personal growth and creativity. They attend six residential week-long courses over two years at the beautiful Westerbecke Ranch in the heart of the wine country in Sonoma, California. The next program starts in September 24-30 of 2019. If you would like to discuss whether the program is right for you, please email Sue Ann Herron to set up a phone call or Skype session. Download an application for the program. •How does the creative process connect us to body, psyche, soul, and world? •How does the person-centered approach enhance emotional intelligence, healing, relationships and manifesting our potentials? 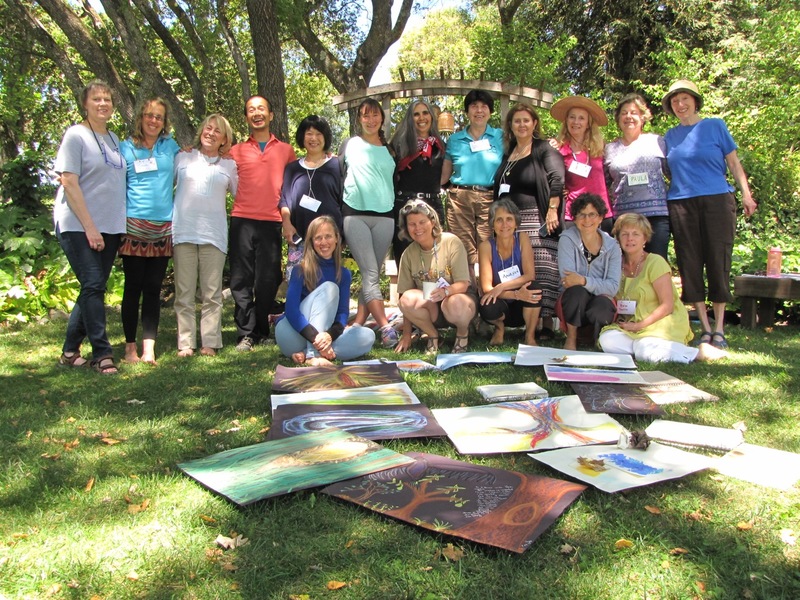 •How do we use expressive arts in counseling and psychotherapy practice? •How do we use expressive arts in groups, such as bereavement and recovery groups? •How does inner peace connect to world peace? 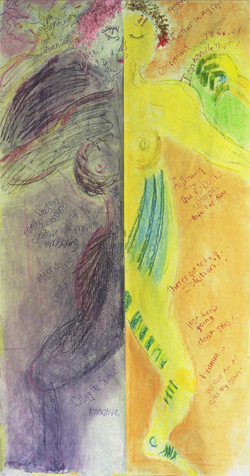 Anyone wishing to use person-centered expressive arts in their work lives or mental health practices. This includes psychotherapists, social workers, pastoral counselors, teachers, nurses, educators and individuals in organizational development. It is also appropriate for those wishing to re-awaken their authentic selves and creativity as a way to enhance their work and personal lives. 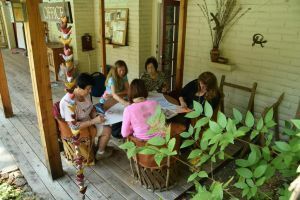 The Creative Connection® process, as developed by Natalie Rogers, interweaves the expressive arts — movement, art, sound, writing and guided imagery — to tap into the deep wellspring of creativity that is within each person. We are coming to understand the need to engage in processes that awaken and integrate all aspects of self: the body, mind, emotions and spirit. Expressive arts does just that — it is a non-verbal language that helps individuals communicate at a deep level. Also, using the expressive arts in psychotherapy is a natural evolution allowing the client to tap into and share unconscious material through the arts. 60 completion certificates have been awarded to PCEAT students during the previous six years of this 450-hour training program. Students came from a wide variety of professional backgrounds including therapists, artists, teachers, business consultants, a physician, an engineer, a scientist, nurses, people from organizational development, sales and marketing, social work, and telecommunications. They came from Argentina, Venezuela, Japan, South Korea, England, France, Finland and the US. The creative spirit within each individual longs to emerge, to be known and celebrated. Yet out of fear, shame, shyness, or just plain reluctance, people put a lid on the deep well—the source—of their creativity. The creative process puts us in touch with our soul, our spirit, our inner wisdom. This initial intensive course provides experience in self-expression through the creative arts — movement, art, music, and writing. This can be a sacred and often mystical experience, transforming pain, anger, fear, and grief into forms that can nourish the soul. This course focuses on the inner journey through a creative process in an accepting, non-judgmental and often playful environment. No art experience necessary. In this course emphasis will be on the theory and practice of the person-centered approach and using the expressive arts in counseling. Using the expressive arts for psychotherapy will be taught via counseling demonstrations and communications triads. Although “Counseling Triads” are used to learn empathy, congruence and unconditional positive regard, this method is also useful to non-counselors to practice good communication skills. Theoretical presentations and discussion will follow those experiences. Readings, discussions, and videotapes of a counseling session will ground the experience in theory and concepts. Applications with various client populations will be discussed. Videotapes of Carl Rogers and Natalie Rogers and others in counseling sessions will be studied. 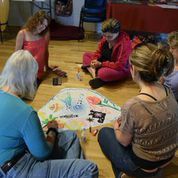 To build trust in the wisdom and wholeness of body, mind, emotions and spirit, students will use expressive arts to explore inner polarities, body awareness, self-image, and metaphor in health and healing issues. Putting society’s ideas of body image aside, a deeper wisdom is discovered. The relationship of childhood experiences to present day body awareness and comfort will be explored through the arts, reading, discussion and writing. This course explores experiential, creative approaches to peace and conflict resolution. We will discuss how we can recognize and appreciate our differences and how to use expressive arts for healing the wounds of social and natural trauma. Students will learn to use person-centered communication skills and the expressive arts to help clarify thoughts and feelings, explore interpersonal communication in emotionally charged situations and envision solutions for personal transformation and social change. Also, the use of expressive arts for healing the wounds of social and natural trauma will be studied. The goal of this course is to give students the opportunity to create and facilitate person-centered expressive arts sessions. With faculty guidance students design and facilitate a two and a half hour workshop for their peers, while keeping in mind the needs of participants during this weeklong course. Students “go behind the scenes” of person-centered facilitation to learn how group dynamics influences workshop design. Learning to give and receive honest, supportive feedback helps students reflect on their strengths and growing edge. Observing sessions offers a more objective learning position regarding group dynamics. The theory of person-centered group dynamics and encounter groups will be studied through reading, viewing videotapes of Carl Rogers and others who facilitate encounter groups, and discussing our own process. This week gives students a second opportunity to design and facilitate a session with peer feedback. This strengthens the student’s skills in creating a positive, nurturing environment for others. Particular attention is paid to the application of person-centered expressive arts with various populations such as play therapy, educational and personal growth groups. Students will receive a Learning Guide (Syllabus) via email for each course. A 10 to 12-page process paper is required after each course except the last one. $8,000 per year ($16,000 total) for this six-week, 450 hour training. A payment plan is available. The courses will take place at the beautiful, historic Westerbecke Ranch in Sonoma, California in the heart of wine country. Charming rustic accommodations, a swimming pool, and our meeting rooms are located on the property. Rooms are shared with other students at $1,039 per residential week and include three on-site chef-prepared meals per day. You can pay your deposit, tuition, and lodging/meals by credit card online or by check or money order. Click here to pay your deposit, tuition, and room & board.